Active community musicians aged 25+ years from all over Western Australia sit side-by-side with WASO musicians to create our Rusty Orchestra. Building on the success of this program in recent years, musicians will attend sectional and full orchestra rehearsals to prepare a free performance for the general public, which is a highlight of Education Week. Frankie is in jail for serious offences of assault and drug possession. She’s bitter, disenfranchised and just wants to live life on her terms. But jail is a temporary escape for her – free from financial hardship, homelessness, and hunger. Cracked is the story of Frankie as she rages her way through the criminal justice system with the hope of being reunited with her kids. Weaving several narratives, Cracked shows the complexity and disconnectedness of people that fall into a life of crime, and the trials faced by prisoners and others who are determined to help them find a better life. Written by Barbara Hostalek, whose first play Banned sold out two seasons at The Blue Room Theatre in 2018, Cracked is a powerful and thought-provoking look inside our criminal justice system from an exciting new voice. Perth Makers Market is Perth’s largest exclusively handmade artisan market. their high quality goods to the public in a lovely, welcoming atmosphere. Award-winning director Damon Gameau (That Sugar Film) is back with “2040” – a documentary where he embarks on a journey to explore what the future could look like by the year 2040 if we simply embraced the best solutions already available to us to improve our planet and shifted them rapidly into the mainstream. This is the narrative the next generation needs to see, to aspire to, and to believe is possible. Ahead of the official release of the film on 23 May, Damon Gameau will attend advance Q&A screenings across Perth at the end of April. Weird, wonderful and strange stories read by professional actors with live music. Lit Live: Strange Bedfellows commences at 7pm. Centre for Stories is at 100 Aberdeen Street, Northbridge. The Moro Spanish Film Festival opens on April 24 with Champions, the critically acclaimed feel good film that smashed box office records in Spain last year! Opening the festival on April 24 will be the Best Film winner at the Goya Awards (Spanish Oscars) Champions (Campeones). This film, by Javier Fesser stars Javier Gutiérrez as Marco, an ambitious and arrogant basketball coach forced to train a team of people with disabilities. Touted as a “comedic slam dunk” by The Hollywood Reporter, Spain’s exuberant 2019 foreign language Oscars entry is the ultimate feel-good film that will leave audiences grinning from ear to ear. The Opening Night Fiesta includes Sangria on arrival and the premiere screening, followed by an afterparty at Connections Nightclub with drinks, catering by Pinchos and live entertainment by Jere Sosa. Screening exclusively at Palace Cinema Paradiso from 24 April – 15 May, the 2019 Moro Spanish Film Festival features 32 films from Spain and Latin America, including special presentations and events, innovative documentaries, and a spotlight on female directors. Perth Makers Market is Perth’s premier handmade artisan market and offers high quality handmade crafters from WA an opportunity to sell their goods and a great time for everyone at a family friendly event. With over 150 stalls to browse from, food to keep your tummy happy and kids’ activities including the fantastic on site pirate ship playground it’s going to be a great day out for the whole family. A can-do fun filled show suitable for all ages. Combining circus, puppetry & dance with a whole bunch of bouncing balls!! A black comedy about gangsters in London’s East End during the 1960s comes to the Old Mill Theatre this May – and it has more twists and turns than a pretzel. Presented by Maverick Theatre Productions, A Picture of Betrayal is written and directed by Noel O’Neill and explores the day-to-day life of criminals going about their business of thieving, cheating and killing each other. Ray uses initiative he doesn’t have and makes decisions best left to others, causing the wheels of scheming retribution to be set in motion. The question remains: who will be left with the prize? Since moving to Perth more than 20 years ago, he has appeared on stage and directed and written numerous shows for the Old Mill and KADS Theatres, Graduate Dramatic Society and the Irish Theatre Players. O’Neill has won numerous awards for writing and directing and has previously worked as a lecturer at the WA Academy of Performing Arts and Perth Actors’ Collective. Most recently, he has written and directed the sell-out production The Trials Of John Boyle O’Reilly and is currently appearing as Watto in the ABC-TV series The Heights. A Picture of Betrayal plays at 7.30pm May 8, 9, 10, 11, 16, 17 and 18 with a 2pm matinee May 12. Tickets are $30, $25 concession – book at www.trybooking.com/BBJDQ. 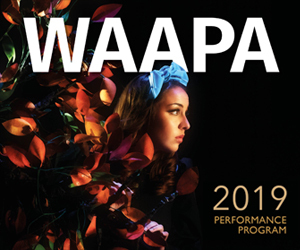 Showcasing an array of stunning art from renowned and emerging artists within WA each year, this premiere fundraising event enables enrichment of Arts programs for students in the Specialist Visual and Performing Arts (SVAPA) and Music programs at Mt Lawley Senior Senior High School . With artist registration closing on 15 April, we are excited to see what beautiful pieces will be available for lucky bidders this year. Students from Mt Lawley SHS Arts programs get ready to help out with the Lawley Art Auction.